Can a little thing like a strategically-placed sapling bring your audio or video network to it’s proverbial knees? Yes, it can! 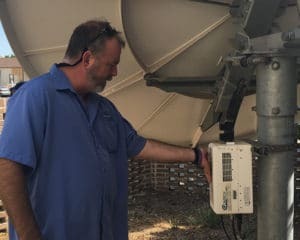 The health of your satellite uplink isn’t something to take lightly, since there are all sorts of wacky things that can affect transmission. Over the years we’ve seen it all. You may have experienced a few of these issues yourself! So here is our Top 5 Avoidable Uplink Disasters, with suggestions from us on how to keep these potential disasters at bay. Water in a feed horn, waveguide or connectors will produce fade and reduce performance. Water can get into the feed horn through a broken or damaged plastic cover. 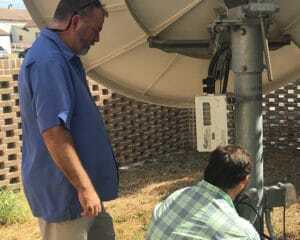 Even a little water in the waveguide will reduce performance, even at a C-band uplink site. And if the water sits in the waveguide for too long it can be damaging to the copper plating inside the waveguide. SOLUTION. Water damage usually goes hand in hand with a lack of adequate taping. Inspect your connections, waveguide and feed horn on a regular basis to ensure everything is sealed up solid. We like to use an item called tommy tape; it’s a stretchy tape that keeps water out of those places where it can cause the most damage – like your connectors. Keep these areas water tight, and any time your replacing connectors don’t forget to tape up afterwards. Lawn mowers, trimmers and leaf blowers all produce debris that can be damaging for the cooling system of the amplifier. Uplink amplifiers are usually mounted on the king post or the feed arm. They produce high frequency transmissions, and get hot in the process. Fans are used to pull heat away from the amplifier, while cooling fins allow air to circulate through the unit. The same fan designed to cool the unit can pull yard clippings, leaves and trash into amplifier, blocking the fan and causing the unit to run hot – ultimately damaging the power supply and possibly the RF components as well. SOLUTION. Try to keep lawn mowers, trimmers and leaf blowers away from the uplink amplifier. Inspect the amplifier visually for debris in the unit. If there is junk around the fan, you should be able to see it. You’ll probably also notice that the fan will be running slower than usual – hotter than usual, as well. If you do need to clean it out, shut down the uplink, pull the cover off and use a paint brush and/or a shop vac to clean out the system. Death by lawn tractor is a particularly painful way to lose network lock. A less-than-careful lawn guy gets too close and either bends the feed arm or cuts a cable. Both spell disaster for your network, since a new feed arm can take up to two weeks to replace. SOLUTION. In a word? Fencing. Not only does it keep the riffraff out, it keeps these types of accidents from occurring in the first place. SOLUTION. Fencing to eliminate bovine and equine fade, and a solid, secure feed horn to keep wasps at bay. A common issue at uplinks and downlinks, yet it never fails to take us all by surprise. That sapling, barely more than a stick when your uplink was originally installed, is 60 – maybe even 70 FEET away – yet it has the audacity to grow…right smack dab into your uplink’s line of site. The tree that wasn’t an issue, suddenly IS. When do folks first notice tree fade? Usually in the spring, when the tree is starting to leaf out. SOLUTION. Walk the property and make note of plantings, and take care of them before they become problematic. For optimal transmission, keeping line of site clear is imperative. Your satellite uplink is outside, constantly exposed to wildlife, the elements, and changing landscape. Your best offense is a good defense. 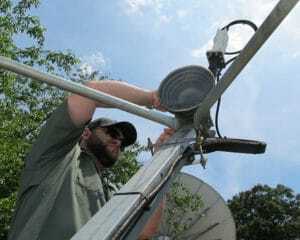 Keep your uplink in tip-top shape by frequently inspecting the equipment and surrounding area. Let’s keep your transmission performing at it’s best.